Can be used on multiple different three vessel, two vessel or single vessel brewery systems. These stainless steel helixes are one meter long and can be applied in multiple brewing setups. Generally, the helix can used as a replacement for a false bottom in a mash tun. Brewers also use the helix as a replacement for the bazooka screen or can be put on the pick up tube for the bottom of the kettle in a 20-60L brewery setup. 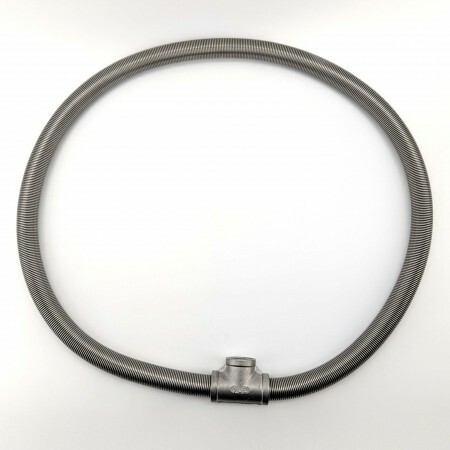 The helix attaches to the brewery system’s ball valve with a half inch stainless steel T-piece where it will thread directly into the female threading of the fittings. The helix will work to filter trub and particulate matter from the kettle while also helping to pick up wort from just underneath the ball valve opening. Once an order has been placed KegLand cannot change/add to an order or change the shipping information. If you require extra items, a secondary order will have to be placed with additional shipping costs. Please note that some items are coming from multiple warehouse locations and may not be delivered at the same time.